Figure A. FITC conjugated mouse anti porcine CD3 (MCA5951F) and Alexa Fluor 647 conjugated mouse IgG1 isotype control (MCA928A647). Figure B. FITC conjugated mouse anti porcine CD3 (MCA5951F) and Alexa Fluor 647 conjugated mouse anti porcine CD45 (MCA1222A647). All experiments performed on red cell lysed porcine blood gated on lymphocytes. Data acquired on the ZE5™ Cell Analyzer. Figure A. FITC conjugated mouse anti porcine CD16 (MCA1971F) and Alexa Fluor 647 conjugated mouse IgG1 isotype control (MCA928A647). Figure B. FITC conjugated mouse anti porcine CD16 (MCA1971F) and Alexa Fluor 647 conjugated mouse anti porcine CD45 (MCA1222A647). All experiments performed on red cell lysed porcine blood gated on lymphocytes. Data acquired on the ZE5™ Cell Analyzer. 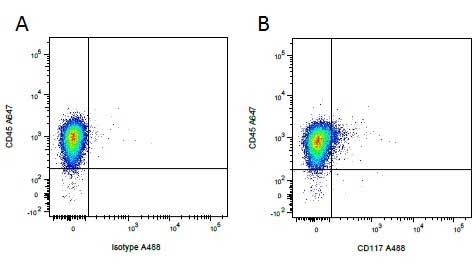 Mouse anti Pig CD45 antibody, clone K252.1E4 (MCA1222GA) used for the identification of contaminating leukocytes in bone marrow derived mesenchymal stem cell cultures by flow cytomery. Characterization of pig BM-MSCs. (A) Single-cell suspension plated at 4000 cells/cm2 formed abundant colony forming units (CFUs, purple dots) after 9 days of culturing. The average number of CFUs (>50 cells/CFU) was 158.8±7.0. (B–D) Upon proper induction, osteogenic (B), chondrogenic (C) and adipogenic (D) differentiations of pig BM-MSC were confirmed by their characteristic stains, respectively (arrows). Calibration bars: 50 μm. 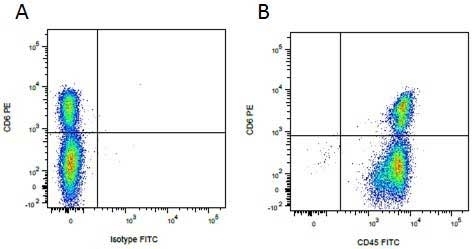 (E–F) Flow cytometric analysis of obtained pig BM-MSCs in the first three passages showed positive expression of MSC surface markers (CD44 and CD105; E) and negative expression of hematopoietic surface markers (CD45 and CD11b; F). Scaffold-Based Delivery of Autologous Mesenchymal Stem Cells for Mandibular Distraction Osteogenesis: Preliminary Studies in a Porcine Model. 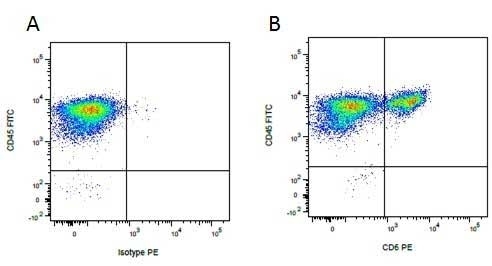 Figure A. FITC conjugated mouse anti porcine CD45 (MCA1222F) and purified mouse IgG2a isotype control (MCA929) detected with goat anti mouse IgG2a PE (STAR133PE). Figure B. FITC conjugated mouse anti porcine CD45 (MCA1222F) and purified mouse anti porcine CD6 (MCA1221GA) detected with goat anti mouse IgG2a (STAR133PE). All experiments performed on red cell lysed porcine blood gated on mononuclear cells. Figure A. Purified mouse anti porcine CD6 (MCA1221GA) detected with goat anti mouse IgG2a PE (STAR133PE) and mouse IgG2b FITC isotype control (MCA691F). Figure B. Purified mouse anti porcine CD6 (MCA1221GA) detected with goat anti mouse IgG2a PE (STAR133PE) and mouse anti porcine CD45 FITC (MCA1222F). All experiments performed on red cell lysed porcine blood gated on mononuclear cells. Figure A. FITC conjugated mouse anti porcine CD14 (MCA1218F) and A647 conjugated mouse IgG1 isotype control (MCA928A647). Figure B. FITC conjugated mouse anti porcine CD14 (MCA1218F) and A647 conjugated mouse anti porcine CD45 (MCA1222A647). All experiments performed on red cell lysed porcine blood gated on mononuclear cells. 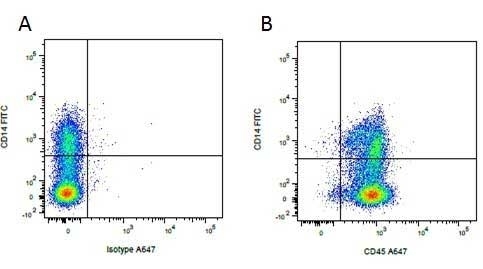 Figure A. A647 conjugated mouse anti porcine CD45 (MCA1222A647) and FITC conjugated mouse IgG2b isotype control (MCA691F). Figure B. A647 conjugated mouse anti porcine CD45 (MCA1222A647) and FITC conjugated mouse anti porcine CD14 (MCA1218F). All experiments performed on red cell lysed porcine blood gated on mononuclear cells. Figure A. FITC conjugated mouse anti porcine CD11R3 (MCA2309F) and APC conjugated mouse IgG1 isotype control (MCA928APC). Figure B. FITC conjugated mouse anti porcine CD11R3 (MCA2309F) and APC conjugated mouse anti porcine CD31 (MCA1222APC). All experiments performed on red cell lysed porcine blood gated on mononuclear cells. 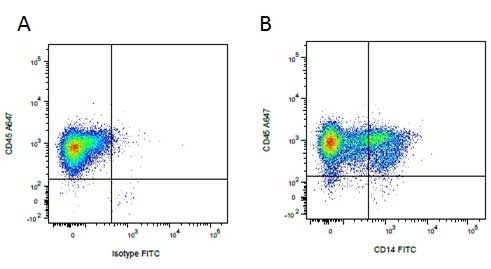 Figure A. FITC conjugated mouse anti porcine CD45 (MCA1222F) and PE conjugated mouse IgG1 isotype control (MCA928PE). Figure B. FITC conjugated mouse anti porcine CD45 (MCA1222F) and PE conjugated mouse anti porcine CD16 (MCA1971PE). All experiments performed on red cell lysed porcine blood gated on mononuclear cells. 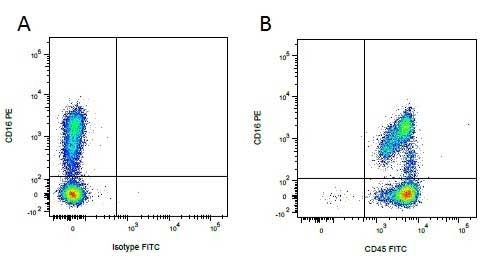 Figure A. PE conjugated mouse anti porcine CD16 (MCA1971PE) and FITC conjugated mouse IgG1 isotype control (MCA928F). Figure B. PE conjugated mouse anti porcine CD16 (MCA1971PE) and FITC conjugated mouse anti porcine CD45 (MCA1222F). All experiments performed on red cell lysed porcine blood gated on mononuclear cells. 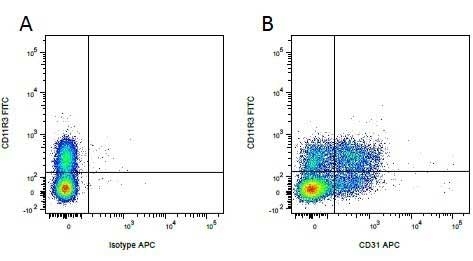 Figure A. A647 conjugated mouse anti porcine CD45 (MCA1222A647) and A488 conjugated mouse IgG1 isotype control (MCA928A488). Figure B. A647 conjugated mouse anti porcine CD45 (MCA1222A647) and A488 conjugated mouse anti porcine CD117 (MCA2598A488). All experiments performed on red cell lysed porcine blood gated on mononuclear cells. 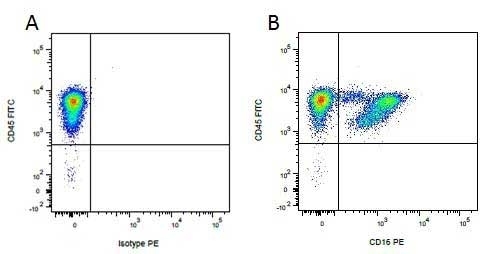 Figure A. FITC conjugated mouse anti porcine CD3 (MCA5951F) and purified mouse IgG1 isotype control (MCA928) detected with RPE conjugated goat anti mouse IgG (STAR76). Figure B. FITC conjugated mouse anti porcine CD3 (MCA5951F) and purified mouse anti porcine CD45 (MCA1222GA) detected with RPE conjugated goat anti mouse IgG (STAR76). All experiments performed on red cell lysed porcine blood gated on lymphocytes. Data acquired on the ZE5™ Cell Analyzer. Mouse anti Pig CD45, clone K252.1E4 recognizes an epitope common to all porcine CD45 isoforms (Schnitzlein et al. 1998). CD45 is also known as leukocyte common antigen (LCA). Mouse anti Pig CD45, clone K252.1E4 immunoprecipitates three polypeptides of 226, 210 and 190 kDa from preparations of porcine peripheral blood mononuclear cells and shows a broad reactivity pattern with both lymphoid and myeloid cells (Zuckermann et al. 1994). Spleen cells from immunised BALB/c mice were fused with cells of the P3 - X63 - Ag.653 myeloma cell line. Yang, P. et al. (2002) Immune cells in the porcine retina: distribution, characterization and morphological features. Invest Ophthalmol Vis Sci. 43 (5): 1488-92. Terzic, S. et al. (2002) Immunophenotyping of leukocyte subsets in peripheral blood and palatine tonsils of prefattening pigs. Vet Res Commun. 26: 273-83. Barker, E. et al. (2006) The larynx as an immunological organ: immunological architecture in the pig as a large animal model. Clin Exp Immunol. 143: 6-14. Vilahur, G. et al. (2015) Roflumilast-induced Local Vascular Injury Is Associated with a Coordinated Proteome and Microparticle Change in the Systemic Circulation in Pigs. Toxicol Pathol. 43 (4): 569-80. O'Leary, S. et al. (2004) Seminal plasma regulates endometrial cytokine expression, leukocyte recruitment and embryo development in the pig. Zelnickova, P. et al. (2006) Postnatal functional maturation of blood phagocytes in pig. Vet Immunol Immunopathol. 113: 383-91. Bimczok, D. et al. 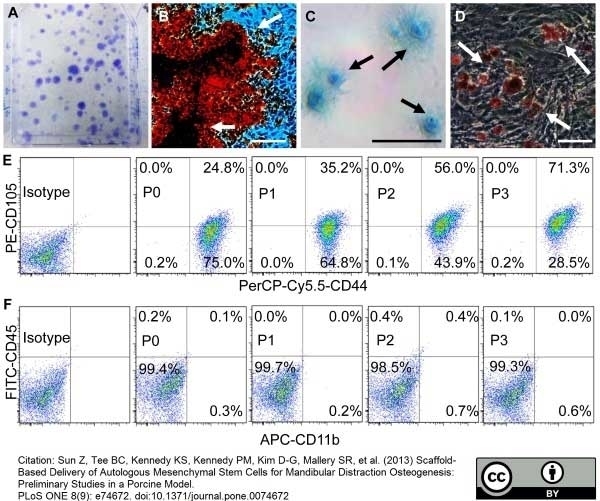 (2006) Phenotype and distribution of dendritic cells in the porcine small intestinal and tracheal mucosa and their spatial relationship to epithelial cells. Cell Tissue Res. 325: 461-8. Nochi, T. et al. (2004) Biological role of Ep-CAM in the physical interaction between epithelial cells and lymphocytes in intestinal epithelium. Bimczok, D. et al. 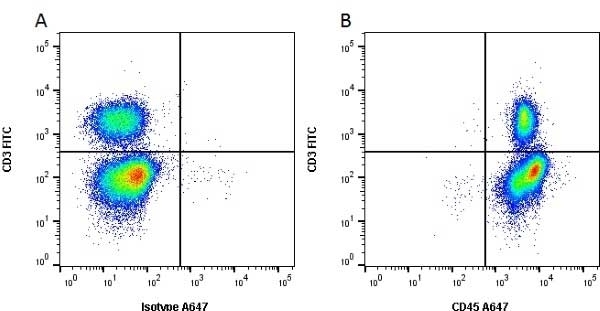 (2010) Primary porcine CD11R1+ antigen-presenting cells isolated from small intestinal mucosa mature but lose their T cell stimulatory function in response to cholera toxin treatment. Vet Immunol Immunopathol. 134: 239-48. Ebdrup, L. et al. (2008) Dynamic expression of the signal regulatory protein alpha and CD18 on porcine PBMC during acute endotoxaemia. Scand J Immunol. 68: 430-7. Plánka, L. et al. (2009) Use of allogenic stem cells for the prevention of bone bridge formation in miniature pigs. Plánka, L. et al. (2009) Comparison of Preventive and Therapeutic Transplantations of Allogeneic Mesenchymal Stem Cells in Healing of the Distal Femoral Growth Plate Cartilage Defects in Miniature Pigs. Acta Vet. Brno 78: 293-302. Plánka, L. et al. (2008) New options for management of posttraumatic articular cartilage defects. Splíchal, I. et al. (2002) Escherichia coli Administered into Pig Amniotic Cavity Appear in Fetal Airways and Attract Macrophages into Fetal Lungs. Juhásová, J. et al. (2011) Osteogenic differentiation of miniature pig mesenchymal stem cells in 2D and 3D environment. Heino, T.J. et al. (2012) Comparison of the osteogenic capacity of minipig and human bone marrow-derived mesenchymal stem cells. J Orthop Res. 30: 1019-25. Stepanova, H. et al. 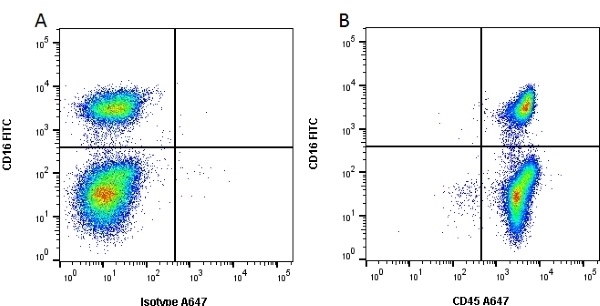 (2012) CD4+ and γδTCR+ T lymphocytes are sources of interleukin-17 in swine. Hester, S.N. et al. (2012) Intestinal and systemic immune development and response to vaccination are unaffected by dietary (1,3/1,6)-β-D-glucan supplementation in neonatal piglets. Clin Vaccine Immunol. 19: 1499-508. Noort, W.A. et al. (2011) Human versus porcine mesenchymal stromal cells: phenotype, differentiation potential, immunomodulation and cardiac improvement after transplantation. J Cell Mol Med. 16: 1827-39. Thorum, S.C. et al. (2013) Impact of diet on development of bronchial-associated immunity in the neonatal piglet. Vet Immunol Immunopathol. 151: 63-72. Thorum, S.C. et al. (2013) Dietary (1,3/1,6)-β-D-glucan decreases transforming growth factor β expression in the lung of the neonatal piglet. Nutr Res. 33 (4): 322-31. Koskinas, K.C. et al. (2013) Synergistic effect of local endothelial shear stress and systemic hypercholesterolemia on coronary atherosclerotic plaque progression and composition in pigs. Int J Cardiol. 169 (6): 394-401. Franzoni, G. et al. (2013) Assessment of the Phenotype and Functionality of Porcine CD8 T Cell Responses following Vaccination with Live Attenuated Classical Swine Fever Virus (CSFV) and Virulent CSFV Challenge. Clin Vaccine Immunol. 20: 1604-16. Filová E, et al. (2009) Regionally-selective cell colonization of micropatterned surfaces prepared by plasma polymerization of acrylic acid and 1,7-octadiene. Bimczok, D. et al. (2005) Site-specific expression of CD11b and SIRPalpha (CD172a) on dendritic cells: implications for their migration patterns in the gut immune system. Eur J Immunol. 35: 1418-27. Sun, Z. et al. (2013) Scaffold-Based Delivery of Autologous Mesenchymal Stem Cells for Mandibular Distraction Osteogenesis: Preliminary Studies in a Porcine Model. Post, I.C. et al. 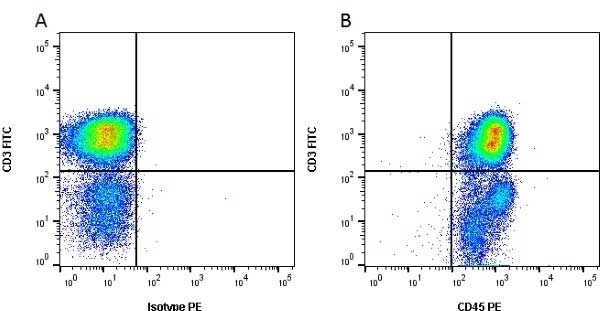 (2013) Characterization and quantification of porcine circulating endothelial cells. Foubert, P. et al. (2015) Uncultured adipose-derived regenerative cells (ADRCs) seeded in collagen scaffold improves dermal regeneration, enhancing early vascularization and structural organization following thermal burns. Rayat, G.R. et al. (2016) First update of the International Xenotransplantation Association consensus statement on conditions for undertaking clinical trials of porcine islet products in type 1 diabetes--Chapter 3: Porcine islet product manufacturing and release testing criteria. Antonson, A.M. et al. (2017) Maternal viral infection during pregnancy elicits anti-social behavior in neonatal piglet offspring independent of postnatal microglial cell activation. Brain Behav Immun. 59: 300-312. Westover, A.J. et al. (2016) An Immunomodulatory Device Improves Insulin Resistance in Obese Porcine Model of Metabolic Syndrome. J Diabetes Res. 2016: 3486727. Kaczmarek, M.M. et al. (2013) Seminal plasma affects prostaglandin synthesis and angiogenesis in the porcine uterus. Biol Reprod. 88 (3): 72. Valpotić, H. et al. (2018) Dietary supplementation with mannan oligosaccharide and clinoptilolite modulates innate and adaptive immune parameters of weaned pigs. Pol J Vet Sci. 21 (1): 83-93.